Big-game hunting is banned in Pakistan by government regulations, except community-controlled areas with an existing limitation on exact kinds and numbers of species as well as countries they can be exported in. There is decline in such species as cranes, geese, storks, pelicans, and houbara bustards- and these are just migratory birds. The illegal hunting is leading to the continuous loss, fragmentation and degradation of natural habitats that include forests, rangelands, and freshwater and marine ecosystem. Some species in Pakistan are already extinct, and many are internationally threatened. The 1996 IUCN Red List of Threatened Animals classifies 37 species and 14 sub-species of mammals that occur in Pakistan as internationally threatened or near-threatened. The Red List is based upon field data that is more than 20 years old and needs to be re-assessed. One can only imagine how the situation with endangered species has changed during these years. The country also provides critical habitat to 25 internationally threatened bird species and 10 internationally threatened reptiles. By the virtue of our rich traditions, incomparable hospitality and great cultural values, all Pakistanis render great respect to Foreign Hunters ... In fact, they reckon them as heroes and consider a great honor to become their friends. So don't be surprised when you receive overwhelming hospitality hard to be found elsewhere in the world. This makes us so proud to host our foreign guests and make their hunting holidays an unforgettable experience ! Hunters are given personalized care & utmost attention by our experienced team of hunting professionals with good support of game watchers & scouts from the community based organizations and provincial wild life departments who spend days & nights stalking the animals in their areas. The official hunting season begins on 01 October & ends on 31 March. However, this season varies in each province. For example, it's 01 Oct - 23 April in the Northern Areas and 15 Nov - 15 Mar in Punjab and so on. 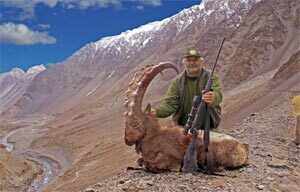 The best time to hunt anywhere in Pakistan is between Mid November & Mid January, This is the time when most of vegetation is covered with snow on the mountain but still available at lower altitudes, like meadows, gullies, ravines, alluvial fans & places near the villages and roadsides. So the animals migrate to these lower pastures and can be hunted easily but if one gets too late, the walks-n-stalks in deep snow on steep ridges become difficult, though, the game is still visible in abundance at lower altitudes. Hunting safaris are managed by a team of professional hunters and experienced guides, game watchers, game scouts, cooks, sardars, porters and drivers. 4WD Jeeps, porters or pack animals carry all food, camping & kitchen gear including your personal baggage. All you need to carry is nothing more than your binoculars, while your day pack which may include your spotting scope, tripod, spare ammo, water bottle, rain gear, camera, personal medicines (if any) & other items of your choice & your gun will be carried by our staff.